Re: Where is MH370 ? Since this is an educational forum, let's try to set up a cue WITHOUT the benefit of a photo, just to work through the thought process of cue development. What would be the most useful part of the aircraft for cue development without the use of a photo? I would think the black box. Whether you think you can or cannot, you are right! Excellent. Now you know where you want to end up, how do you get there? "Life is not measured by the number of breaths we take...but by the moments that take our breath away"
The black box is orange. Would cockpit (where black/orange box is) not a better cue? A flight recorder is an electronic recording device placed in an aircraft for the purpose of facilitating the investigation of aviation accidents and incidents. Commonly referred to as a black box, there are two common types of flight recorder, the flight data recorder (FDR) and the cockpit voice recorder (CVR). In some cases, the two recorders may be combined in a single unit. The Flight Data Recorder would probably be a better term to find the aircraft. If events transpired as reported in Linda Moulton Howes report on her earth files.com website which was posted recently in this forum, I would expect the U.S. Government to have tampered with the recorder at Diego Garcia and it could then even be a different recorder with new faked data and the same " serial number". How would that affect our target? If / when they ditched it at sea (13.5 degrees north, 97.5 degrees east) it would be preferred to have the correct tail number. Can we target the tail number even though numbers are not generally recognized by the Matrix? And we are referencing 370, are we not? Many if's and maybe's to be sorted out here. Ok. Even though I don't believe a data point with out even one other source to be enough to change a live operation, I'm game for a challenge on this thought experiment. If we are going to assume the FDR and CVR are untenable what questions/ what do we need to think about? The question was the most useful part of the aircraft for cue development? Do we even need to specify a part? Could we let our unconscious pick? We would need to focus on a part that would clearly identify it as belonging to the plane. Let's make it the most easily identifiable part. Also, let's make that part significant in anyway we might need. Compared to before where the emphasis was on the significance and we would rather have identifiable emphasized. Or am I just off. Albeit, these numbers could be repainted with another number, but, the original registration number still belongs to that one, single plane. Kind of like changing a vin number on a stolen car, truck, etc. ; the original number still belongs to that one vehicle. How would you incorporate that into a cue? I have a few ideas and that is what I was getting at when I said MH370 might need clarification. All right, numbers would pose a problem. I would drop the easily. A 'most significant identifiable part', still, might be different for each viewer, but we might not know unless we experiment. Well I think that in this case, where we are using numbers as identifying information, it will be ok. I have used numbers in addresses and of course CRV originally used number coordinates. I think the history has been not being able to perceive alphanumerics. Then 'easily' may have an advantage if going to ground truth. ok in this situation. I thought about using 'easily' since my last post, and, it seemed to me, that using it would be dependent entirely upon qualifiers, as you have stated in your post. Your cue as stated will not give you what you are looking for. The front end of your cue needs work. It lacks a starting point. Why would the matrix know you were talking about that plane? Flight numbers are used over and over again every day. they just describe the time of departure and arrival on a specific flight path. What is it you are after? Something about this plane that is "significant"? The word identifiable is not only ambiguous, (identifiable to whom? ), but is also most likely untested. At least as far as I can recall. I may be wrong though. Re: CRV; The LearnRV protocols are the second, probably third, step up in the evolutionary chain from that method. Don't get me wrong, there is knowledge there about how this skill has evolved into what it is today, but I would imagine it would be best suited for a "research" project or interesting read. Keep at It and Keep Posting It! This specific cue is one I have been working on for a while now. [nnnn / nnnn ] " Current most significant recognizable missing Malaysian Airlines airplane / location now "
All right, the cue as Rossu & I stated won't work. The Learn RV discs cover cueing, although, cues are best understood by working through them as a skill set. Major Dames' cues in Learn RV are so precise, that one would think hardly any work went into them. (Only about 30 years.) But, a solid cue is the first path to a session. As to CRV: I've heard that the manual is not the first go-to for up to date info. Thanks for your input. Ok, so I'm assuming Kocmodpom is asking what is the most useful part of the aircraft to help us locate something that will be useful in solving the big mystery of where the plane or wreckage is now, as well as what happened to cause the disappearance. Keep in mind we are over two months into the disappearance. I would agree that that would be the most useful part of the aircraft to help achieve the purposes stated above. Indeed. I have several "black boxes" around my house. There are two common types of flight recorder, the flight data recorder (FDR) and the cockpit voice recorder (CVR). In some cases, the two recorders may be combined in a single unit. Now we're getting closer and more precise. I would not use the above abbreviations in a cue as they could refer to anything from the recorders to a person's initials and possibly to other pieces of equipment. Possible conspiracy theories aside, I think it best to target the location of a known, designated piece of the aircraft and work backwards from there which would presumably reveal any deceptive/diabolical 'funny business' that may have subsequently become associated with said aircraft piece. Can we target the tail number even though numbers are not generally recognized by the Matrix? If numerals are not recognized by the Matrix then how/why would target reference numbers (TRNs) be useful to us? Now targeting and perceiving alphanumeric characters via remote viewing is another story. It is extremely difficult but can be done sometimes by natural psychics and/or by using newer, advanced RV/HARV methodologies. Don't ask me. I don't know how yet. Identifiable to whom and for what purpose? Identifiable to a search plane/boat with spotters and searching equipment? I doubt the information produced would be of any use to such a crew as they would likely already be prepped to spot what they needed to. But I understand the thought here and under some circumstances such information could actually be useful. Maybe if they were trying to see a tail fin but RV data revealed they should be looking for one of the engines that has identifiable pieces floating on the water whereas the tail fin was obliterated and/or buried in the sea floor. But like Daing said, identifiable may be an untested, vague search term. That is exactly where I would start. I would assume you are correct but I am not completely sure. The serial number could apply to two planes in this case. But I would hope that when one uses that particular serial number in a cue, the Matrix would deem the missing plane the most significant in terms of RV results due to all the emotional/mental 'energy' associated with it. I agree. I don't think it's a good attack strategy for these purposes. Indeed. If you were working to become a good, experienced, knowledgeable doctor, would you rather go to medical school in 1986 or 2014? That's not too bad. But no part of the plane was specified, which was the point of this thread. I think you could even probably drop most significant recognizable from the cue and it would still work. Of course if Malaysia Airlines has more than one missing plane at the moment then I would leave the cue alone, or just drop recognizable. 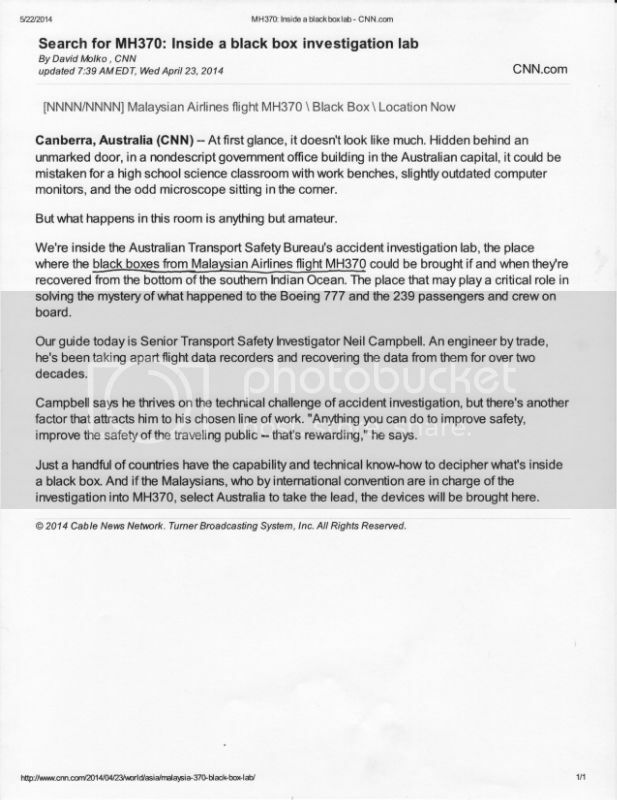 But if the plane is not actually missing to certain governmental entities then the cue may be problematic. I recommend we be specific for our purposes/goals. I believe the two recorders in this particular plane were located separately. I would substitute location now with pinpoint location if I were going to then use a HARV/specialized methodology to zero-in on the location. Your input is welcomed and I appreciate help. However, your claim that cue “will not give you what you are looking for” is not persuasive or supported well. 2. You state that identifiable is ambiguous and a reason to support your claim. It is true that identifiable is ambiguous in the way you mentioned. But isn’t “recognizable” ambiguous in the same way? Recognizable to whom? What about significant? Significant to whom? Yet aren’t these proven search terms? The deduction is that ambiguity, specifically the way you defined it, does not invalidate a search term. Obviously this could be a case of induction. But, as you humbly pointed out, and I believe you are correct, it is an untested term. Unfortunately, it does not prove induction nor substantiate your claim. Just because a term is untested does not mean that it will not give what is sought. What I am looking for is a hands on learning experience in cue formation and some guidance on what things to think about while processing a cue. Secondly, I am always looking for cues which offer diversity and practicality. I thank you for the formula and will add it to my notes. In this case, luckily, I do believe that the cue we used follows that formula. Although we had not “stepped down” to the Detail level the discussion did touch on this. I believe I parsed this correctly. Please correct if I have not. Last edited by RossU on Mon May 19, 2014 2:40 pm, edited 1 time in total. Using registration has a few drawbacks. First, you can not assume that Malaysia Airlines holds the registration as the company Malaysian Airline System Berhad has a number of other brands including Malaysia Airlines. Which brings the second problem, registration numbers can be reused. The reasons can be anything from vanity to retirement of aircraft and the legalese depends on the location. Also, the use of airplane vs areoplane is not standardized. Unless you know of a cue that tested it, I believe we run into the same problem that you stated about the use of "identifiable". So where to go from here? I guess we could call Malaysia Airlines to find if they hold the registration number and if they know if it was used on any other plane. But I would hope that when one uses that particular serial number in a cue, the Matrix would deem the missing plane the most significant in terms of RV results due to all the emotional/mental 'energy' associated with it. go against a major cue formulating tenant: "Specificity! Intent be damned! To turn a phrase from a chapter of RV best left for “research”. Pshaw! BTW, I would rather be the passionate Doctor. who knows all the history. I’d want to learn it all. Let it be my passion. I'd want to know the strength and weakness of each methodology. The reason for their inception and passing. I read the old and the new, Democritus to Warcollier to Dames, and the others and the heretics! Which, out of respect for this classroom, will go unnamed. I will stay on-topic from here on out. First, you can not assume that Malaysia Airlines holds the registration as the company Malaysian Airline System Berhad has a number of other brands including Malaysia Airlines. That doesn't matter. I specified the plane with the registration number 9M-MRO belonging to Malaysia Airlines. Which brings the second problem, registration numbers can be reused. The reasons can be anything from vanity to retirement of aircraft and the legalese depends on the location. If you go here, I find that this particular registration number is still tied to the Boeing 777-2H6/ER in question, as far as I can tell. I'm not an expert in aviation registration websites but I did enough research for a good starting point. We know empirically that airplane is a valid Matrix search term. I'm not sure about identifiable. Yes it could work depending on the cue. Test it and see sometime. Yes, and in addition to that, flight data recorders, ping characteristics, satellite data, sonar equipment, Orion search planes, etc. Working real world RV problem sets is ideally educational for general and technical knowledge as well as RV development. Yes, but at the end of the day after pulling your hair out researching the internet for registration number procedures, you gotta start somewhere (if there is no photo). While we strive for specificity whenever possible, in the end it's up to the viewer how much time he/she wants to spend in cue formulation vs. sitting down and performing a 45 minute session and seeing what comes out based on the cue they have come up with. Excellent. We need people like you. Bring that passion to RV and you'll go far. I find that this particular registration number is still tied to the Boeing 777-2H6/ER in question, as far as I can tell. I'm not an expert in aviation registration websites but I did enough research for a good starting point. Just because you say it belongs to Malaysian Airlines does not make it so. That 100 bucks in your wallet belongs to DaingMaing. A car, owned and registered to your parents, that your drive, has Tiger74 stenciled across the hood with flames down the side and ladies man splash guards, is stolen. Telling the police that car belongs to you is not correct information. If Malaysian Airlines is valid then I think that MH370 is too. Let me rephrase. I specified the plane with the registration number 9M-MRO associated with Malaysia Airlines. I didn't mean belonging to in the sense of legal ownership, but rather in the way you might say the word rather belongs to this sentence. From what I understand, registration numbers can only apply to one plane in service at any given time. I would rather use a registration number for our cue than a flight number (MH370) for the reasons that DaingMaing stated. Your argument for the current, cultural significance of the flight number is valid and it might indeed work in a cue. In fact, I believe I successfully used it in a cue a while back although it was qualified by airplane crash, as there was an airplane crash associated with that flight number as revealed by our location work. Is there a flight data recorder associated with the alphanumerics MH370? Yes there is but there may be more than one if different planes were used for that flight. We are trying to be as specific as we can and not waste RV time and efforts with ambiguous cues. Legal ownership doesn't always have to be a factor for the reasons in your above example. Things can become associated with other people/places/things. A crash became associated with a plane, and vice versa. Also, anything with a proper noun/name is usually a safe search term (Malaysia Airlines). I would even say it always is. Let's take my suggested cue for example. Malaysia Airlines airplane 9M-MRO is qualified by flight data recorder, which is qualified by location now. Ed gives a good example on either the LearnRV DVDs or the Master Tips DVDs about Lincoln and the Gettysburg Address that helps understanding of cue formulation and the way that the Matrix responds to search terms similar to the way Google does. In fact, I believe I successfully used it in a cue a while back although it was qualified by airplane crash, as there was an airplane crash associated with that flight number as revealed by our location work. Are you able to post this cue? I ask for my own edification. I would rather use a registration number for our cue than a flight number (MH370) for the reasons that DaingMaing stated. We are trying to be as specific as we can and not waste RV time and efforts with ambiguous cues. Let me be clear about a few things. What I am doing is engaging you in debate over an opposing cue to develop a specific working cue, gain experience, solidify working knowledge, and hopefully learn something. This will end when you wish it, I wish it, and /or a cue is developed that we and others agree with. I see that you believe the cue I defending may work. Let us both be sure to not hold the fallacious belief that because one cue works another won’t. Multiple cues can work. I believe the registration numbers is the stronger position, maybe not the way you have it worded precisely. If you look back in the thread I didn’t jump on them because I wanted to work from the weaker position. I learn more defending a weaker argument. In the end a blend of both might prove best. Who knows now. But, I am willing to work through it if you are. From what I understand, registration numbers can only apply to one plane in service at any given time. Good point. Is 9M-MRO still in service? 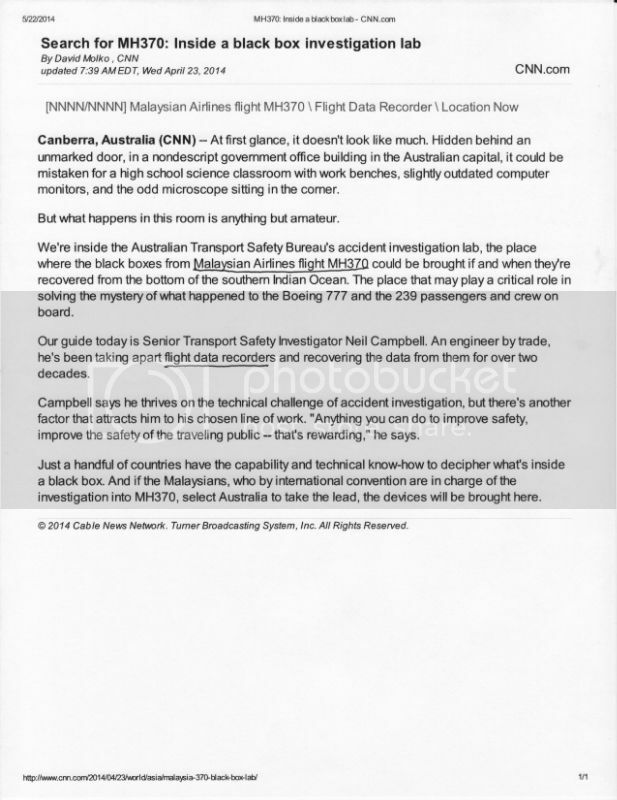 Is there a flight data recorder associated with the alphanumerics MH370? Yes there is but there may be more than one if different planes were used for that flight. Your right. I checked. Malaysian Airline Systems is still using this number 370. So I would need to add ‘current missing’. Also, I would like to update my Cue to bring it closer to cues that we know work empirically. If you still want me to argue for MH370 I will. I don’t think I would be allowed to change in a formal debate. But with the end goal of the best cue I hope you don’t mind. I took the liberty of piecing together your argument into one point. If you feel these need to be discussed separately let me know. I didn't mean belonging to in the sense of legal ownership, but rather in the way you might say the word rather belongs to this sentence. Also, anything with a proper noun/name is usually a safe search term (Malaysia Airlines). I would even say it always is. Your argument for the current, cultural significance of the flight number is valid and it might indeed work in a cue. Legal ownership was what I thought you were using. But, if you are not using Legal then aren’t you using cultural significance? Why would a proper noun be such a sure thing? Isn’t a proper noun only proper because of its cultural significance? There may be other reasons, a personal level significance for example, like when you RV’d those missing glasses, but may not apply. As an aside, I don’t think “current” has anything to do with it. If someone RV’d “TWA Flight 800” before they flew wouldn’t they know not to? Things can become associated with other people/places/things. A crash became associated with a plane, and vice versa. You have touched on something here but I will save it for another thread or the debates end. That is why I'm here. I was asking the Matrix about Malaysia Airlines Flight 370. I qualified that with any possible airplane crash that might be associated with that flight designation. I then qualified that with the primary cause of the airplane crash. In hindsight, I might have dropped primary from the cue in this case. But I feel it worked out OK because first of all, I got exactly what I asked for. The primary cause of the crash was the airplane going in a downward direction out of the sky. But the Matrix (not only a librarian, but a teacher) said "..and since you asked this question, you may also be interested in this additional information." Then I received information about a long, drawn-out plan, a 'war' in the cabin or cockpit, one of the pilots (sinister) away from the cockpit and a pilot being unable to see. According to my analysis, those were all contributing factors to the crash. It appears that my results matched the Major's results which he announced shortly after I posted my work. So in my opinion, my cue worked. Of course that assumption is based on corroborating data with another, professional, remote viewer's front-loaded data and not ground truth, at this time. That is the purpose of this discussion. I don't know that I would call this a debate but call it what you will, we're learning and making progress. Polarized arguments/debates/discussions always facilitate growth and understanding, in my opinion. If you want to argue the 'weaker' position, you bring polarity to the discussion. I consider this productive, so far. And of course multiple cues can work to achieve the same goal. I think we're adding confusion by focusing too much on cultural significance vs. legal ownership. There is no dichotomy there when it comes to cue formulation. A properly constructed cue will work regardless if either is present. Planet Pluto/smallest rock , for example. I just try to keep in mind how/if something is tied-to or associated with whatever I'm trying to qualify. That was my thought process when I constructed the above cue to find out about the cause(s) of the crash. I hope I'm explaining that adequately. But I used his full name just to be rock-solid and get in the habit of being as precise as possible. The importance, complexity, time table and number of viewers on any given RV project-problem set will determine how much time a task master will spend in cue formulation/formalization. Indeed, if they were a good remote viewer and analyst. You just illustrated my previous point. But again, I wouldn't feel comfortable tasking that to someone else. If I wanted to spend my own time on it, so be it. If you were pursuing ground truth then you would eventually prove yourself right or wrong anyway. To throw in another idea, we could target the flight data recorder or cockpit voice recorder directly if we had their serial numbers. Last edited by RossU on Thu May 22, 2014 7:45 am, edited 5 times in total.